Monday, May 6th at 7pm in the Lovejoy High School Auditorium (map link). Doors will open at 6:30pm. General admission tickets are $10 for students and $20 for adults. Tickets can be purchased in advance via this link. You might not have heard of Sal Lozano, but you have heard him. He plays with Gordon Goodwin's critically acclaimed Grammy Award Winning Big Phat Band. A few of the artists Sal has also recorded with include Paul McCartney, Natalie Cole, John Legend, Christina Aguilera, Lady Gaga, Stevie Wonder, Lalo Schifrin, Brian McKnight, Michael Buble, Keely Smith, Barbra Streisand, Joey DeFrancesco, and Maynard Ferguson. Sal has been a member of the Dancing with the Stars House Band, the American Idol House Band, and the Academy Awards Orchestra along with numerous other television and commercial credits. He can be heard on numerous movie soundtracks including Incredibles 2, Straight Outta Compton, LaLa Land, Sing, Joy, The Secret Life of Pets, Joy, Ice Age 5, National Treasure, Legally Blonde, Phineas and Ferb the last three Star Trek movies and Disney’s Beauty and the Beast, to name a few. Sal is also a clinician for Disney’s Performing Arts Workshops at the Disneyland Resort in Anaheim, CA as well as Disney's All American College Band at Disneyland. 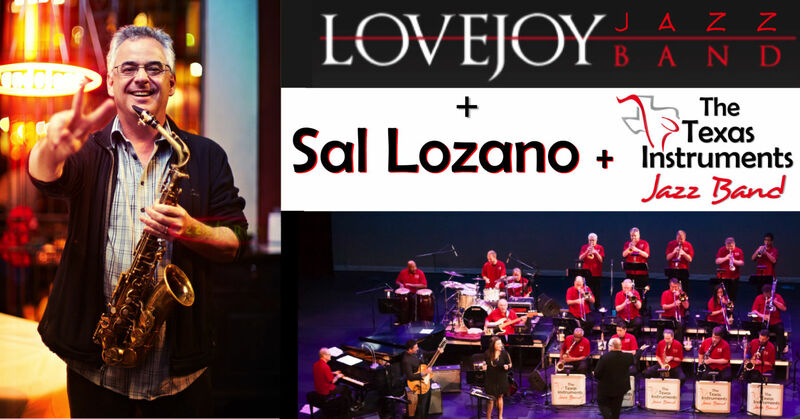 Special Offer - Attend the rehearsal with Sal Lozano and the TI Jazz Band and then have dinner with Sal and some band members. Rehearsal will be Sunday, May 5th at 4pm with dinner following. Contact Paul Westbrook, paul@enerjazz.com for more info. Limited to 6 people. Price $80 each. The Lovejoy Band Booster Club receives the profits from this event.